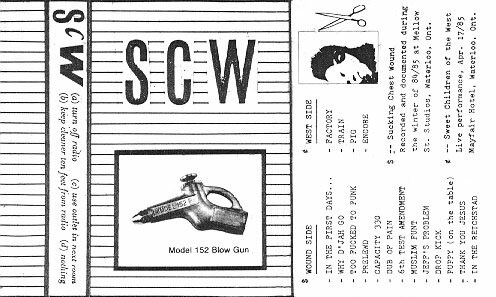 SCW’s second release on cassette came out in mid-1985 and was a mixture of new material and live recordings from the Sweet Children of the West show in April that year. The new material continued in the same disco-funk-industrial post-punk style of the first cassette, with added horns in some tunes. This release marked the end of SCW’s use of analogue synths, drum machines and tapes – all future work was done using either ‘real’ instruments played live or digital samplers and effects. On April 17 1985 SCW returned to the Mayfair Hotel in Kitchener, Canada for another performance. This time they performed upstairs at a club called Level 21. For reasons that aren’t entirely clear they performed as Sweet Children of the West; the name would be resurrected later on when they were banned from performing as Sucking Chest Wound. The focus of the show was on videos prepared beforehand and played back on video monitors located throughout the performance space, along with slides projected onto the stage. SCW performed largely behind screens, occasionally venturing out onto the stage to tweak knobs etc. 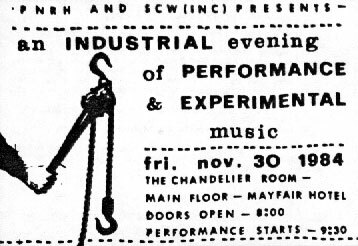 The first proper SCW performance occurred on November 30, 1984 at the Chandelier Room of the Mayfair Hotel in Kitchener, Canada. The show came about through a Fine Arts course that PnrH was taking at the University of Waterloo. The show was actually marked by his professor and applied towards his credit for the course! By mid-1984 SCW had established a practice and recording space at Willow St. in Waterloo, Ontario, and had access to the electronic music labs at the University of Waterloo. In August of that year they released their first cassette, entitled Arbeit Macht Frei. Why’re you trying to kill yourself? In 1984 the four members of SCW were all students at the University of Waterloo in Ontario, Canada. Jeff-o and dWM had enrolled in computer music courses, thereby gaining access to the electronic music studio in the basement of Conrad Grebel College. The studio was equipped with recording facilities, a grand piano, a Roland Juno-60 synthesizer, an E-mu Drumulator, and a huge Moog modular synthesizer (either a model 55 or 3C). SCW had absolutely no idea what they were doing when they were using most of the gear, especially the Moog. However large portions of the first SCW tape release were created and recorded in this studio. Here is a raw recording of experimentation using the Moog modular and Juno-60 (with the Moog sequencer triggering the Juno arpeggiator). Some of this material was used on the first SCW cassette tape release. At some point in 1984 PnrH, Jeff-o and Roba all moved into a house beside the railroad tracks on Willow St. in Waterloo, Ontario. Chemical tankers would pass within a few feet of the house during the day. The damp basement of the house was designated as a sound experimentation laboratory, and various musicians and weirdos would come by to participate in jam sessions with the trio. One of these was dWM, who SCW had seen perfoming in a multimedia show, and who quickly joined as an official member, thus forming the first stable incarnation of SCW. Roba purchased a Fostex 4-track cassette recorder and a Roland TR-606 drum machine. Jeff-o purchased a Yamaha CS01 synthesizer, then sold it and bought a Roland SH-101 synth that could sync to the drum machine. dWM brought in a variety of musical junk including a trashed string machine with no markings and an empty oil drum. Electrical shocks were common and served to further inspire the four members. Sucking Chest Wound was hatched out of the acid-drenched brains of PnrH and Jeff-o in the winter of 1982-83 in Waterloo, Canada. After many all-night listening sessions absorbing the likes of Throbbing Gristle, The Residents, Caberet Voltaire, PiL etc., the two decided to form a band. The logical first step was to come up with a righteous name. 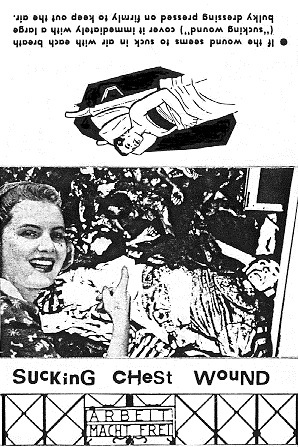 PnrH – having served in the cadet corps of the Canadian Armed Forces – happened to have a military first-aid manual describing a particularly nasty form of bayonet injury: the Sucking Chest Wound. The next step was to produce some music. Having no instruments or musical abilities presented a challenge. After some initial experiments with a 3-head cassette deck in a feedback loop, Jeff-o purchased a Mattel Synsonic drum machine, and Pnrh dug up a guitar named Pokey and purchased a Mysto Dysto fuzz pedal. They then set out to recruit some additional members. The first incarnation of SCW consisted of drum machine, Yanaha CS-80 synthesizer, guitar, bass and vocals. No recordings exist of this version of SCW and only one live gig was ever performed. By this time Roba had joined the group, and would remain as a member of SCW until 1991.